This early in the season, however, Raylan has yet to meet Mr. Markham, instead forced to converse with the likes of his low-level henchmen like the oversized dimwit Choo-Choo (Duke Davis Roberts). 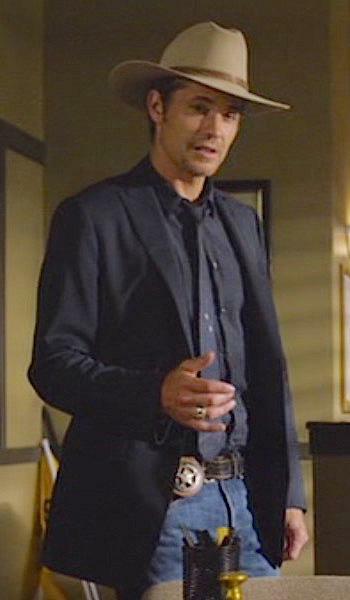 After some uneven experimentation in early episodes, Raylan Givens had established his usual look over the six seasons of Justified. In addition to the cowboy hat and boots from which he never deviated, one could expect to see the taciturn lawman strutting into the office in a black suit jacket, jeans, and skinny tie or the “denim sandwich” of a trucker jacket and jeans when off-duty. Sure there had been variations, with different suits and sport jackets in shades of gray and brown entering the mix but rarely anything more colorful than that. Winona: Brown suit, black suit. 1, 2, 3, 4 shirts. Two pairs of jeans. 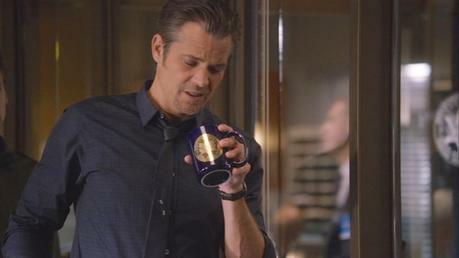 Raylan: What the hell’s that supposed to mean? Winona: Oh, just by looking at your closet one would think you were a simple man. It’s thus a surprising single-episode departure when Raylan spends the entirety of the sixth season’s “Cash Game” episode in an all blue ensemble anchored by a navy single-breasted peak-lapel suit jacket. This solid navy jacket is softly napped like doeskin flannel. With a standard welted breast pocket and straight flapped pockets, the style of the jacket implies that it is orphaned from a lounge suit, though Raylan only wears it with jeans for its sole onscreen appearance. There are long side vents, allowing a little more room for the bulge created by Raylan’s holstered full-size Glock on his right hip. The jacket has roped sleeveheads and is loosely shaped with darts, though Raylan somewhat negates the fitted effect by wearing it open. The peak lapels are pick stitched at the edges, rolling to the top of a two-button front with four smaller matching buttons on the ends of each sleeve. Rather than opting for contrast with a lighter shirt or tie, Raylan sticks with a generally monochromatic scheme by wearing a navy shirt and tie. This lack of contrast keeps the look informal, harmonizing with his jeans better than a dressier and lighter blue shirt would. The mini-checked cotton shirt has a slim spread collar and narrow front placket that reminds me of the standard offerings at places like Banana Republic, J. Crew, and Macy’s during the “slim fit” craze of the mid-2010s. This connection makes sense as much of Raylan’s clothing was known to be sourced from these retailers, though this may be the navy-and-black checked A.P.C. shirt that made an appearance during the show’s final episode and would be auctioned following the production. Raylan often wore vintage ties sourced by the show’s costume team, and this satin-finished navy tie is likely no exception. Two off-kilter gray-stitched rectangles in the center of the tie break up the solid navy ground. Raylan wears his standard Levi’s 501 jeans, recognizable by the familiar little red tag on the inside of the back right pocket. These “Original Fit” jeans have a button fly and standard five-pocket layout, sitting low on his waist. 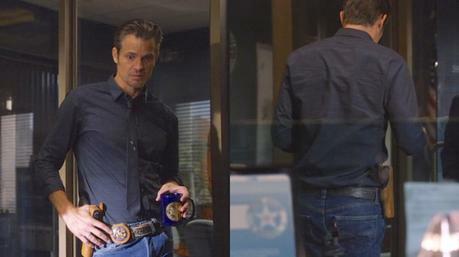 Raylan smirks while sartorial purists shudder. Like Raylan himself, his trusty tooled leather belt has seen plenty of wear and tear with the dark brown leather slightly worn on the top and bottom edges. There is tan contrast stitching along the edges and a steel single-prong buckle. On the right side of the belt, Raylan carries his Glock 17 in a tan-finished full-grain leather paddle holster, custom-made to resemble the Bianchi Model 59 Special Agent® that he’d worn in the first season. 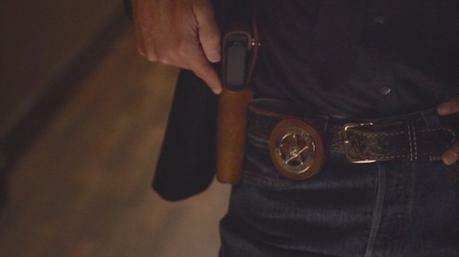 Glock and badge: the tools of Raylan’s trade. 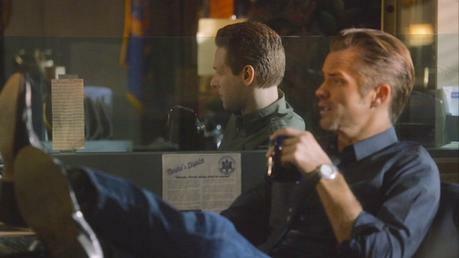 In the early episodes of Justified, Raylan stood tall in a pair of anteater cowboy boots from Lucchese, though he switched to the somewhat less expensive ostrich leg boots following the show’s second season. The Western-heeled boots have decorative stitching on the shafts, though they tend to be mostly concealed by Raylan’s jeans. Raylan cuts off Choo-Choo’s pursuit. 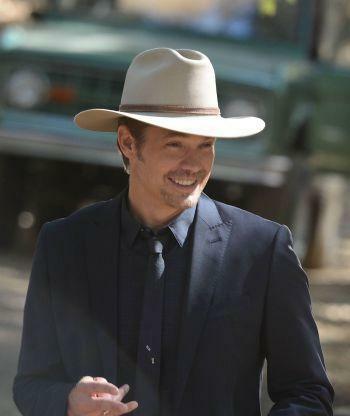 By now, you know that Raylan Givens completes his cowboy image with a hat to supplement the boots. 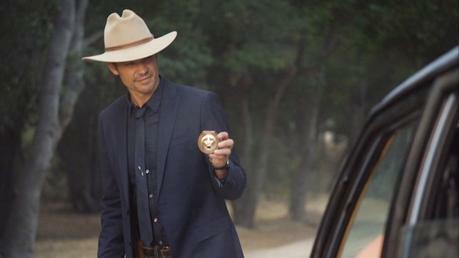 Baron Hats custom made this sahara tan 200XXX beaver hat with a 4.25″ cattleman’s crown, 3.25″ brim, and slim ranger-buckled tooled leather band for Timothy Olyphant to wear on the show, and it continues to market “The RG” hat on their site. 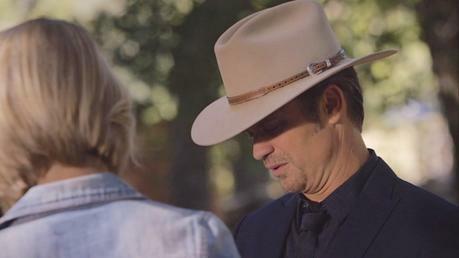 Raylan consults with Ava (Joelle Carter) for his 1:30 “haircut”. Raylan sports a practical yet stylish TAG Heuer Series 6000 Chronometer on his left wrist. This watch has a brushed steel case, white dial, and black leather strap, though he often substitutes it for a brown leather strap in coordination with his other accessories like boots and belt. An always welcome exchange with fellow marshal Tim Gutterson (Jacob Pitts) over morning coffee. One last cowboy touch: Raylan always wears a textured sterling silver ring with a horseshoe shape on the third finger of his right hand. Check out the entire series, though this episode makes its sole appearance in the sixth and final season. Son, are you real smart or real stupid?